Jon Rolfe was kind enough to send me his Matrix ceramic lap to play with. I had a bunch of sapphire queued up, and went to town. I hated my old ceramic with the burning passion that only ceramic laps and sociopathic mass-murdering dictators usually rate. I'd managed to get decent polishes on sapphire with my Darkside, even with the tin lap but not amazing and not all that fast. The Matrix starts out feeling a bit rough. 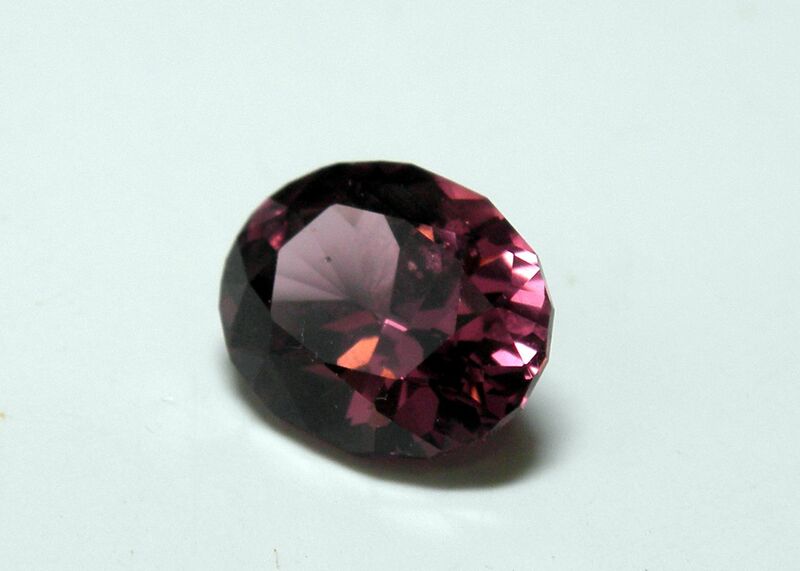 I decided to break it in with 60k Diastick and the piece of synthetic ruby I keep around for use such purposes. About 10 minutes and it was smoother and ready to rock. It's fabulous. I got clean, flat, fast polishes coming off 3k prepolish. It used very little Diastick and even less Snake Oil. I polished nearly dry. It could move facets when I needed to, which was always a bit sketchy on the softer laps. 5 sapphires later it's my go-to for corundum. I haven't tried it with anything else - yet - but will. I think, because it is not "My" product, I can comment without ethical failure. That weird "Off The Dop" sunstone was done on the MATRIX, and polished promptly with 60 K on the pavilion and later, chrome oxide on the table and crown. 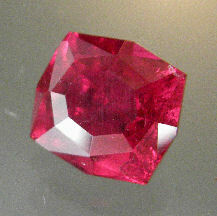 The Ruby: I had some old badly cut Burmese ruby c.a. late 1970's early '80s. I selected one of excellent color, but with a single flaw, and cut a small octagon, which I polished on the MATRIX. In removing the epoxy, and make it extra clean for photography, I gave it a few minutes in acetone. As it dried, A MILLION LIITLE CRACKS APPEARED. I heard of emeralds being oiled all the time. I did not suspect it was done with ruby. I have consistently noticed a vitreous finish on all the stones I have polished on the Matrix lap. 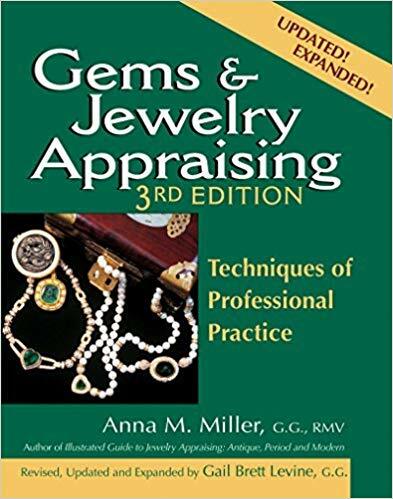 This has become my primary lap for materials that I would polish with diamond. Does anyone tested it with topaz? Curious to know if the matrix has been used as a pre polish lap yet? I never attempted to prepolish with it as that would clog many of the pores, thus defeating the porous feature of the lap. I would recommend the BATT if you want a chargeable pre-polish lap. Prepolish range particles would fit into the First Order pores. I think they would just get in the way, though. This is not a simple sponge. There are at least two more orders of self-similar complexity, hence the high FD. Short Version. No. It's a polishing lap. 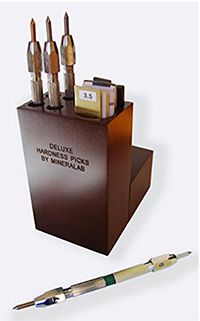 A solid vitreous ceramic can be used on any size grit, if one can get it to work. These ceramics have been more universally successful in other applications. Lisa's post prompted me to break out my Matrix lap which has been wanting attention. 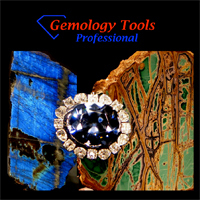 It works great on Topaz and I have 2 sapphires in line to cut next. Can't wait to get to the polishing! No detail is too small. Think about it. Hope the ones I acquired from a different source are not the same. I got these stones nearly forty years ago. Whoever sold me these is probably long since Worm Food, anyway. You kill me - you make me laugh like NO ONE ELSE on the planet!!!!!!!!!!!! 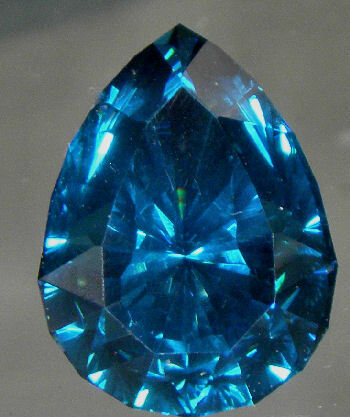 Since we know the MATRIX™ works on sapphire and topaz, I suppose it is no surprise that it works on CZ. 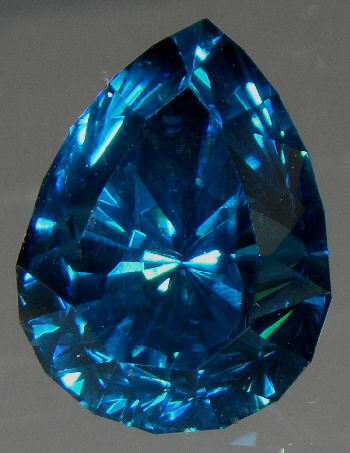 26 Carats, 12.5 X 17mm, 129 facets. After polishing a blue sapphire, I did the usual rinsing of my Matrix lap. This time, I decided to also give it an ultrasonic cleaning. In the ultrasonic unit, I noticed billows of cloudy substance disperse out of the lap surface into the water, making it very turbid. This material undoubtedly contained some sub-micron diamond particles, but it also may have contained cutting swarf from the stones I have polished on it. The color of the Matrix was unchanged after the ultrasonic cleaning. I have improved my polishing technique on this lap, which differs greatly from what I used to use on a ceramic lap. I used the ceramic lap stationary or very low speed, which I could describe as a crawl. I used the Matrix with a diamond slurry at a rotation of around 60 rpms with a very slow sweep over no more than 2 centimeters. These specifications allowed a quick polish and flat facet. So this Matrix lap sounds like a rigid structured sponge??? Particles of a certain size and smaller can be trapped in pockets in the surface?? If this is true, what prevents them from releasing from the lap, balling up and causing scratches? Clearly the lap is working well for people. I'm not challenging its effectiveness. I'm just wondering about the maintenance. Does every one need an ultrasonic to keep this new lap clean?